I could have also titled this post, Where did my baby go? Cholita needs a U.S. passport, that was made abundantly clear to us at the Canadian border, but I'll admit that I've been reluctant to get it done, reluctant to file away the last tangible reminder of Cholita's life as Jin Qiu Ju. 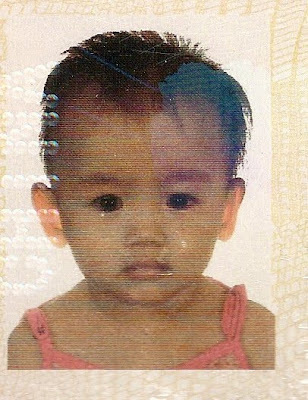 The picture for her Chinese passport was taken before we met her, probably when she was moved from the foster home where she'd lived for a few weeks and put back in the orphanage. It breaks my heart. And those eyes. It's the shell-shocked look she sometimes got during our first few weeks together, when she felt overwhelmed and would simply shut down. Enough of the English. Enough of the Caucasian faces. Enough of the changes. We were in the food court at the mall yesterday and she pointed to a man behind a counter. He was cooking at a wok, speaking Mandarin to his co-worker. "I think he's Chinese," she said. "I think you're right," I told her. "I used to be Chinese," she said. "Hmmm," she smiled and crinkled her nose. "Kind of." So it's time for her U.S. passport. She'll always kind of be Chinese. Always kind of be Jin Qiu Ju. But that baby with the scared eyes is not the sassy little girl who sauntered up to the white screen at the Costco photo center. She's her own unique blend--a little China, a lot United States. A little Qiu Ju, a whole lot Cholita. A little bit of this, a lot of that...and utterly and completely YOUR perfectly precious daughter. This is such a poignant post, Eileen. Beautiful. I'm a "lurker" on your blog. I just love the way you write and I'm jealous of the amazing landscaping that you've been doing. This post reminded me of the blog of one of my friends. 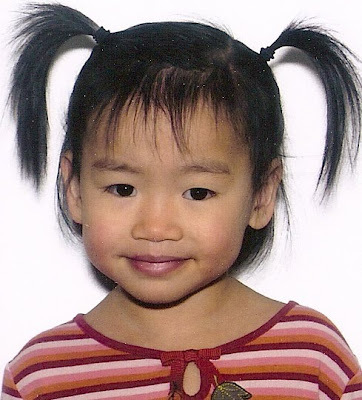 They adopted a daughter from China this year, and it has been so remarkable to read their experiences. I thought you might enjoy it also. BTW - I'm not a total stranger. 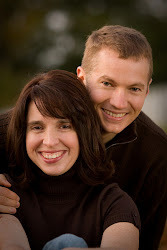 I'm also LDS, and I think my husband knows yours. He's a dentist too. Those eyes! Don't they just haunt you in the night? Beautiful, beautiful baby girl. We just adopted a girl in September. I just watched our Gotcha Day video for the first time. It's remarkable how much our Lilibug has changed in just three months! Can't wait 'til she has enough hair to do the pigtails like your daughter's. She is a beauty! Such lovely eyes. What a precious one you've been blessed with. Okay Im crying. I just think of the WONDERFUL life you've given to your children and I see that first picture and I know that it could be very different. Those are tears of Joy. Merry Christmas!